English Summary/英文概要： Explore the Solar System! 25 Great Projects, Activities, Experiments introduces kids ages 6-9 to the planets, moons, and other celestial bodies that surround our star, the sun, as well as the universe beyond. Combining a hands-on element with history and science, kids investigate solar eclipses, phases of the moon, Jupiter’s rings, and what astronauts wear. Who named the stars? What is the Milky Way? Why is there night? 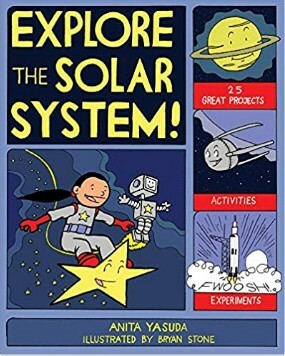 By combining a hands-on element with riddles, jokes, fun facts, and comic cartoons, kids Explore the Solar System!, and have a blast along the way.